Occupied Palestine, October 13 -The Palestinian Boycott, Divestment and Sanctions National Committee (BNC), the largest Palestinian civil society coalition struggling for Palestinian rights, is proud to stand in solidarity with the movements struggling for a new world based on democracy, human rights and economic justice. From New York to Athens, from Madrid to Santiago, from Bahrain to Rome, these huge mobilisations provide a much needed reminder of something that Palestinians have always known – that another world, a dignifying one, is possible and ordinary people can create it. Our aspirations overlap; our struggles converge. Our oppressors, whether greedy corporations or military occupations, are united in profiting from wars, pillage, environmental destruction, repression and impoverishment. We must unite in our common quest for freedoms, equal rights, social and economic justice, environmental sanity, and world peace. We can no longer afford to be splintered and divided; we can no longer ignore our obligations to join hands in the struggle against wars and corporate exploitation and for a human-friendly world community not a profit-maximizing jungle. 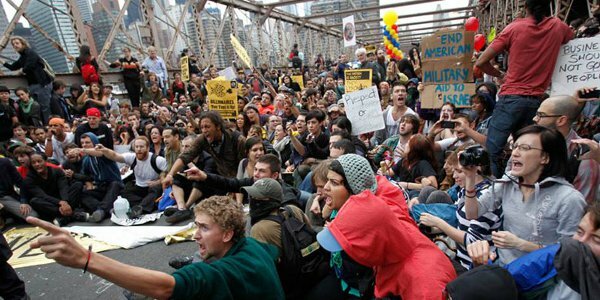 The Occupy Wall Street movement and its counterparts across the US, Europe, Latin America and elsewhere are -- at least partially -- inspired by the Arab Spring for democracy and social justice. Leaders of the Arab popular revolts tell us that they, in turn, were largely inspired by our own, decades-old struggle against Israel’s occupation of our land, its system of discrimination that matches the UN’s definition of apartheid, and its denial of the right of Palestinian refugees to return home. The rapidly emerging movement for Boycott, Divestment and Sanctions (BDS) against Israel until it complies with international law is a key and effective part of the Palestinian struggle. Anchored in universal principles of human rights and struggling for freedom, justice and equality, the BDS movement, established in 2005, is deeply rooted in decades of Palestinian peaceful resistance to colonial oppression and is inspired by the South African struggle against apartheid as well as the civil rights movement in the US. It is adopted by a near consensus among Palestinians everywhere, with all the main political parties, trade unions, professional syndicates, women’s unions, student groups, NGO networks and refugee advocacy networks represented in the BNC, the reference for this growing movement to end Israeli impunity. The Palestinian-led BDS movement is a global effort of groups, from South Africa to Britain, from Canada to India, and within Israel itself, all committed to ending Israel’s denial of basic Palestinian rights. It is endorsed by towering moral leaders of the calibre of Archbishop Desmond Tutu and Holocaust survivor and co-author of the Universal Declaration of Human Rights, Stephane Hessel. It is supported by world renowned cultural and intellectual figures such as Alice Walker, Naomi Klein, Roger Waters, Judith Butler, Sarah Schulman, John Berger, Ken Loach, John Greyson, and Adrienne Rich. Massive trade union federations such as COSATU (South Africa), CUT (Brazil), TUC (UK), ICTU (Ireland), among many others, have also adopted BDS. The movement has scored in the last two years some spectacular achievements when internationally renowned artists and music groups heeded the cultural boycott of Israel and refused to perform there or cancelled scheduled appearances. These have included the Pixies, Elvis Costello, Snoop Dogg, Meg Ryan, Vanessa Paradis, Gil Scott-Heron, among many others. The Norwegian state pension fund, among others, major European banks and some corporations have all been convinced to divest from businesses implicated in Israel’s violations of international law. Increasingly, BDS is recognized as a civic movement capable of ending Israeli impunity and, crucially, contributing to the global struggle against the war-mongering, racist agenda which Israel has persistently played a key role in. So as you break your own chains and build your own effective resistance against corporate tyranny, we ask you to demand a just peace for all the peoples in the Middle East, based on international law and equal human rights. Palestinians, too, are part of the 99% around the world that suffer at the hands of the 1% whose greed and ruthless quest for hegemony have led to unspeakable suffering and endless war. Corporate power has not just profited from our suffering but has colluded in maintaining Israel’s occupation and apartheid to perpetuate an unjust order that profits oil and military companies and multinational financial institutions. We call upon all the spreading social movements of the world to think critically when considering their attitude towards the Israeli ‘social justice’ protests, which have almost completely ignored the key issue at the heart of all of the problems faced by ordinary Palestinians and even Israelis: Israel’s costly system of occupation, colonialism and apartheid over the Palestinian people. Without putting an end to that multi-tiered Israeli system of oppression, our entire region will never enjoy a comprehensive and lasting peace, one that is based on justice and human rights. Money for jobs, health and education, not for racist oppression and occupation! Nowhere is this more important than in the United States. Despite Israel’s persistent denial of Palestinian rights, the US has provided Israel with unconditional political and military assistance that directly contributes to the denial of Palestinian rights, but also to the problems faced by ordinary US citizens. Could the $24bn of military aid provided to Israel in the period 2000-2009 not been better spent on schools, healthcare and other essential services? Did Israel not play a major role in prodding the US to launch and continue its wars in Iraq and Afghanistan, at immense human and material cost, mainly borne by the poorest in those countries? The refreshing scenes of determined peaceful protest for justice from around the world tell us that we, the 99% of the world, are in the process of straightening our backs, collectively, with unwavering fortitude and boundless hope.